Every morning we like to bring you the best tech news of the day in an easily digestible format, courtesy of our friends at TechRadar, and today is no different. We've got news and rumours for you from Samsung, Apple, Microsoft, Spotify and Strava in today's collection. 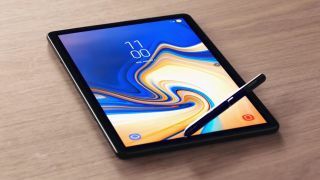 Really good-quality Android tablets are thin on the ground right now, so it's refreshing to see Samsung launch a top-notch slate in the form of the Galaxy Tab S4. You can tell this is positioned to go head-to-head against the iPad Pro: support for a stylus, and for a clip-on keyboard that doubles up as a cover, as well as a premium level of styling and finish. Talking of iPad Pros, the next models rumoured to be coming later this year are going to ditch the border bezels and the fingerprint scanner, apparently. It's a rumour we've heard before, and now it's been backed up by code spotted in the iOS 12 beta – some keen developers have found an iPad Pro icon that looks to have a distinct lack of bezels. Microsoft is looking to tempt users away from the cheaper iPad with the Surface Go, and the low(ish)-cost slate is now available to pre-order from a variety of places, including Amazon and the Microsoft website. The initial launch covers 19 other countries as well as the UK and US, and the cheapest configuration you can get is yours for $399/£379. Strava has a new subscription package to tempt all the walkers, runners and cyclists out there, and it's called Strava Summit (replacing Strava Premium). It takes the bits previously found in Premium, like remote tracking of family and friends and advanced fitness analytics, and splits them up into distinct bundles you can buy separately. Spotify's not just about the music any more – it's unveiled a six-part motion comic series in collaboration with Archie Comics, called Spotlight Archie: The New Riverdale. The series is based on the bestselling comic book from 2015, from writer Mark Waid and artists Fiona Staples, Annie Wu, and Veronica Fish, and it's streaming exclusively on Spotify right now.